I have acquired a wooden sailing vessel after all my wishing; (be careful what you wish for...etc. 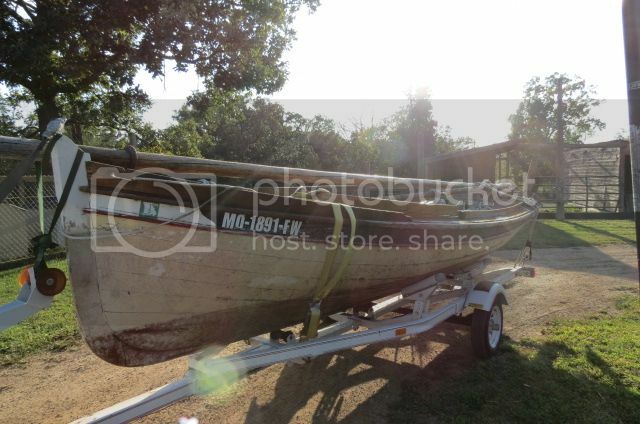 ), and I now have an 18ft boat built in 1972 by the (then) master shipwright at Mystic Seaport. She needs overhauled but she ain't rotten, just dry and needs some scraping, caulking and paint. It will be a lot of labor but it was given to me trailer and all, so the initial cost is not setting me back any. Cannot recall the style or period right off the top of my head, but she has lovely lines and will be a beauty when she sails again. Pictures to follow as soon as I can get to it! I can't wait to see the pictures! That trailer will be a great help in maintaining an older wooden boat! Anybody got a good source for caulking, brass, and bronze fasteners? There is no damage to the hull below the waterline as far as I can see at this point but some of the trim is loose and the nail-in fasteners are not going to hold in the present locations due to shrinkage. There is some damage to the starboard oarlock and splash trim where the idiots at the marina lifted her,(she was swamped and sank at her moorings during some of the severe storms we had this summer) but it isn't anything I can't handle. Other than a lot of scraping, sanding, caulking, and paint there doesn't appear to be anything that says she ain't sound. There are a couple places along the keel where the gaps are going to have to be fitted with some filler pieces due to shrinkage, but the wood is still pretty solid all the way down. She will never be as pretty as she was new, but then who is after 40 years of rough service? She didn't have a name when I got her, so I am naming her Breezy in loving memory of my daughter, Briona Sue, who passed away at age 5 1/2 on Christmas day 1993. Breezy was her nick-name and I think it a fitting name for trim little craft such as this. I hope to get photos up next week. http://www.jamestowndistributors.com/ has a good supply of boat parts, especially for traditional wooden boats. Additionally, I would recommend being extremely weary of any brass components; go with bronze! These days, brass mixtures generally include zinc, which is a sacrificial anode in a marine environment (especially if salt water at all). Besides, personally I feel that the slightly muted look of the bronze vs. extremely shiny brass has a more realistic nautical look to it. Additionally, I had a thought with all the talk you have of shrinkage (I didn't realize it got that cold down south, but I digress). Is it possible on the trailer to fill the boat with water (block it up on the trailer as well to avoid overloading the axle and tongue), as they used to do for ship's boats occasionally in long bouts of warm weather? Add salt, and the wood might expand again once you take care of the worst of the leaks. It might be worth trying at least. Good luck, and I do love the name. West Marine or Hamilton Marine for parts,kits and paints. Try 'Island Cutter' for a stern board. cotton sails might look great for reenactments, but if they haven't been stored properly you might find a good deal of mold. That said, much of the hardware on the sail can probably be salvaged at least, as well as the dimensions. The original sails are in very good shape and have been stored in a house closet inside a plastic tote for the last several years. I laid them all out and checked every square inch. They will be used for photo-ops. and training us lubbers as we "learn the ropes" & such but I will definitely feel more secure under the tan-bark sails. Work on the boat had to be put off for a week as my truck broke in two last week on my way to an event at Fort Osage, so I had to be USN HT shipfitter this week welding the frame back together. (Split in half above the axles on both sides). Oh well, at least nobody got hurt and it was repairable. Planning on getting a newer one after the first of the year anyway. I forgot to bring the camera with me darnitt, so still no photos, but I will get them up asap. No photos = imaginary boat! I can vouch for the rascal, I saw pics that were texted! Trying to remember how to do this download trick....stay tuned! She doesn't look too bad at all, especially if she's as watertight as wooden boats can ever be. A little sanding and paint can go a long way, but at least in the short term it's cosmetic. Hull, propulsion and hardware in good condition are the priorities. Everything else can just be upgraded along the way. Awesome! would be proud to sail with her! Enjoy! Looks like it has a lot of potential... nice boat, Bo. Maybe now BCarp will become a believer. Ha! I hope he will continue to post "encouraging challenges" as the project progresses! I have about 60-70% of the scraping and sanding completed, and am about ready to begin removing some of the old caulking for replacement. Of course now winter has decided to arrive in Mizzourah so weather and temps are going to hold me up some on that, but still plenty of work to do. I believe! I believe! Very sweet lines. Love the shape of the stem! I've had good luck with this polyurethane-based paint: http://www.jamestowndistributors.com/userportal/show_product.do?pid=64&engine=msn&keyword=interlux_brightside_polyurethane There's a "flattening agent" available to mix in if you don't want a gloss finish. Looks like she had an anti-fouling paint on her underside. You don't really need that if she'll spend most of her time on the trailer between cruises. Congrats again, and Happy New Year...! Alright, Bo... DAMN YOU! That's one fine little vessel there! This photo was shot the day I pulled it home from the Corps of Engineers' dry-lot. It still had all the grungy dried crud on it from being sunk in a muddy-bottom cove at the Marina for about a week, then stored in the hot summer sun in a large gravel lot for 6 months. I have since done extensive cleaning, sanding, and scraping. The bottom coat of paint looks like red-oxide barn paint but comes right off with just water... ?? ?